2 RAR embarked for operational service in South Vietnam on 19th May 1967. The unit sailed on HMAS SYDNEY to relieve 6 RAR serving with the 1st Australian Task Force (1 ATF) at Nui Dat in Phouc Tuy Province. During this tour of duty two companies of New Zealand Infantry were placed under command and 2 RAR became an ANZAC Battalion. This would be the first time in the history of the RAR that there had been an official integration of the Australian and New Zealand infantry soldiers working side by side under one name with one purpose. To the Battalion this was an injection of the live ANZAC spirit and a chance to enhance the ANZAC tradition which was known so well. The soldiers of 2RAR/NZ (ANZAC) Battalion took part in twenty-three operations in Phouc Tuy and Bien Hoa provinces and maintained constant patrols and ambushes throughout the area of operation. Nine of these operations were conducted wholly by the ANZAC Battalion. Others were staged with 3 RAR, 7 RAR with armour, artillery, engineer, Army aviation and SASR support. The Battalion’s most successful operation was Operation Coburg that took place in the area of the border between Bien Hoa Province and Long Khan Province north-west of Phouc Tuy Province. This was a Task Force operation, the first in strength outside Phouc Tuy Province. The Task Force relieved the 199th Infantry Brigade (US) with the aim of denying the Viet Cong (VC) access to the area and sites from which they could direct rocket fire into the huge American bases at Long Binh and Bien Hoa. During the operation the enemy launched the ‘TET’ offensive and the number of contacts with the enemy rose sharply and instead of local force VC the unit began to meet well trained main force troops of 274th VC Regiment, 91 VC or North Vietnamese were killed and over 80 weapons captured. In this first tour the ANZAC Battalion killed 187 enemy, inflicted a further 60 confirmed WIA casualties, captured 12 prisoners and 190 weapons. The Australian and New Zealanders had 28 soldiers killed during the tour. 4 RAR relieved the Battalion on 1st June 1968. On its return from Vietnam on 13th June 1968 the Battalion again occupied an area of Enoggera Barracks prior to establishing itself at Lavarack Barracks, Townsville in June 1969. On 15th May 1970 2 RAR officially relieved 6 RAR and resumed the title of ANZAC Battalion with the New Zealanders again under command. The Battalion arrived with three rifle companies ‘A, B and C’. ‘W’ Company Royal New Zealand Infantry Regiment (RNZIR), already halfway through its tour, and ‘V’ Company arrived from Singapore in May, completed the five-company ANZAC Battalion. ‘Support’ Company was augmented by two New Zealand mortar sections, two pioneer sections and a Kiwi Second in Command. ‘W’ Company had the first contact of the 1970/71 tour. In the next ten days ‘W’ Company not only proved the enemy’s presence in the Battalions area of operation (AO) in four contacts and finding many recently occupied camps and bunkers, but killed three enemy. On 26th May the unit moved out on Operation Capricorn and this operation was to be the only true ‘battalion operation’ of the tour. All five rifle companies were deployed together with the single task to locate and destroy the enemy. Operation Cung Chung gave the Battalion new tasks of preventing the enemy gaining access to the principal villages along Route 15 and upgrading the standard of training and operational capability of the regional Forces in the area and working with them and the National Police. 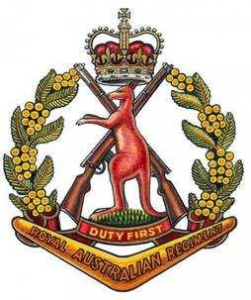 In September 1970, the Australian and New Zealand government’s decision to reduce 1 ATF by one infantry battalion and not to replace the second NZ rifle company when ‘W’ Company returned to Singapore. D445 Local Force Battalion now began a slow movement south into Phouc Tuy Province from its sanctuary in the Mat Toa Hills. Its movements and the contacts which resulted from them were concentrated in the east of the province where 3 RAR had recently commenced operations. Late in March ‘A’ Company was placed under operational control of 3 RAR. On 31st March 1 Platoon ‘A’ Company engaged an estimated two companied of D445 Battalion in the Tan Ru area of Xuyen Moc. The contact lasted about four hours. As a result of the identification of the main body of D445, joint operations with 3 RAR continued during April north of Binh Gia and east of Route 2. Later intelligence indicated that D445 had withdrawn north carrying its wounded. The Battalion’s last operation ‘Final Fling’ in May 1971 returned the unit to the Nui Dinh and Nui Thi Vai Hills. This final month of operations saw only one contact with the enemy, though the fresh tracks and installations located confirmed that both D445 local Force Battalion and 3rd Battalion 33 NVA Regiment were still active in the north and north-east of the province. On 22nd May 1971 the Battalion handed over operational responsibility for the area of operations to 4RAR/NZ (ANZAC) Battalion. 2RAR/NZ (ANZAC) Battalion in its final tour of duty in South Vietnam killed 110 and captured 23 enemy and lost 13 killed and 68 wounded in action. On 15th August 1973, 2 RAR was linked with 4 RAR to form 2/4 RAR.